Just wondering…. I’m still on 1.1.4… I just don’t know what to do about 2.0… Is it better to wait for Installer to be available ? OR if I pwn now and get only Cydia, will I have to do the process all over again ? If you are partial to Installer…I would wait until Installer is available on 2.0. Because, we not exactly sure how it is going to work when Installer is release….you may have to re-pwn your iPhone or they may release it through Cydia. We just have to wait and see. Thanks a lot Brooke ! I LOVE playing around my iPhone but, if I get a chance to only do it ONCE, well it’s better for me. I’ll follow your advice ! i don’t see why you would have to re-pwn (you never have to rePWN it actually, just restore it with a new custom firmware). installer.app is, like the name, just an app, nothing speaks against it being downloadable via cydia. And for now, you will lose SOME of the fancy 1.1.4. installer-acquired apps, but gain the huge variety the appstore offers + some apps that bigboss already ported. 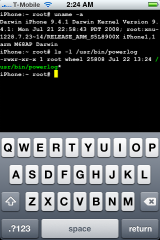 wha tever happened to those days where jailbreaking an iPhone was kinda hard and sort of a difficult process…. Am not complaining that is really easy now to do this stuff, I’m complaining about all those people that seem to be so scared to do anything… GOD!!!! Haha…I remember back in the day, the first jailbreak! It is definitely a lot easier now. Which is great! though I’m sorry for what has been happening to you, we’re talking iPhone related stuff, I’m complaining about people making big deals on the iphone… So before you open your mouth rhinkn before you speak… I’m also being respectful to the forum. Hi Brooke & Doug ;-) When 2.1 comes out will we have to run a fresh pwnage routine or will up-dating 2.1 be covered by pwnage? Absolutely a Mac fan. Who needs system crashes and gates digging deep into your PC registry ;-) You? Hey Rocket, just re-read my reply and it sounds dumb! What I was asking is whether you are a Mac fan as well, not whether you dug deep into PC registries!!! Any fellow English appleiphoneschool followers out there? Hmmm… It deleted my first comment. That’s weird. Anyway, I saw in an article that 2.1 will include possible turn-by-turn navigation features and possible copy and paste functions. I have no idea when it will be release, though. It would be nice if they have copy-and-paste function. I’m dying for it:D Come on Apple!! so will the beta 2.1 when released to public be called 2.0.1 or 2.1.0? hey guys i have a question i have iphone_pc_suit and iPhoneBrowser.1.52 and they wont work on win vista, is there anyway to make them work? im trying to open my phone so i can put some files on there..